Below is a video of how it is currently I am hoping someone might have a good idea. In his case the main section of the curved rails near the blade ends were already there. He had to add onto those and make that center section behind it, that which is part of the angle pivot pin. This used to be a manual angle/tilt blade and the conversion looks grand. Yours looks good, too. The only worry I would have is the weight. 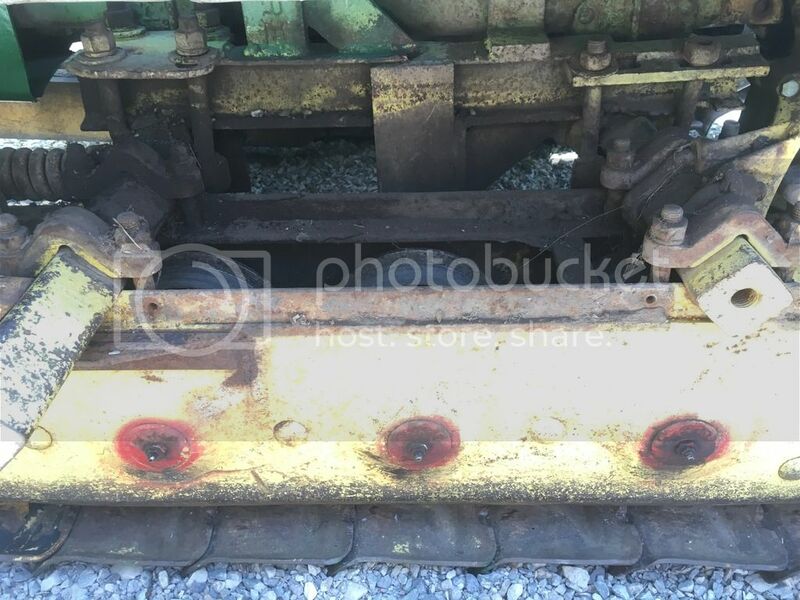 The 3-roller front idler will wind up with a lot of weight on it. Maybe too much. They were meant for loads on the rear rather than the front. Third party outfits made things for the front, and Deere kept extending the track frame as a result. Then, started adding their own stuff onto the fronts. Eventually the spoked idler was changed to solid as well. I wouldn't be opposed to rebuilding how the blade attaches to the tractor, however, i would need a good picture or diagram of where 'further back' would be. I am also thinking about adding some weights to the rear of the tractor to help even out the tractor would that help keep the wear on the front down or is more weight just going to cause more trouble. Keep in mind you are already way heavy on the front end of an MC, adding more stuff just exacerbates that problem. The bottom forward roller will only tolerate this stress for a certain amount of time before wearing out, of failure. Rollers aren't cheap, and can be hard to find. Well, there really isn't a way to mount further back. Adding more weights on the rear just adds stress to the rear roller and the sprocket bearings. The MC is a light machine, and the u/c is light to match. It was meant as an increased pulling machine vs. the M and MT. It had an integral toolbar, usually used to the rear, but also had a light 'tin blade' for use in the front position. Later, there was the light MC60 blade. The 40 saw the 3-roller and then the 4-roller, and it sported a little heavier but still light 61 blade. The 420 was 4-roller with the 61 blade and then 5-roller with the heavier 62 blade. But, the 420 had more power to go with it. The 440 was only 5-roller with the 63 (essentially same as the 62) manual or the 64 PAT blades. Then, the 440 got more power with gas and also a diesel. See where they went with all that? The track frame kept getting longer as the blades became heavier. And, the power kept going up with the rest. Said the guy with a 420c/62 and a 350C/6310. Of course, I wouldn' t ask too much of an MC. The front end is most definitely overweight, the good news is I have an almost complete parts tractor with what appears to be a decent undercarriage (the engine is seized and I am so tempted to find an engine for it and see I would have a second running MC). I have found some neat pictures and some ideas, and now need to talk to a welder/fabricator to see what he thinks. (I can weld but not on something this scale). Another thought I had was to run the two lift cylinders independently there is a fair amount of slop in the bushings that the blade mounts too so there may be a little ability to create enough play that way. Well here is something to chuckle about, the bracket that the hoist cylinder on the left hand side broke today. Started looking at the bracketes on both side and wow they are both cobbled together crud. So I think I will tear them both off and build all new brackets that mount to the tractor. Pictures to follow, I have to figure out how to post/attach them. There is no local photo hosting, as in on the board itself. Have to use a 3rd party site then link to them. Most of us used to host on PhotoBucket. That worked for years, but then they wanted a sizable fee to do so. They cut us all off, so many pics were moved. Some, we thought lost for good, but then PB changed their minds and they are back. I can't recommend them, though, as they might change their minds back again. Some pics would be helpful since what you have isn't anything I have seen on an MC, or even a 40. The 60 and 61 blades only had one lift cylinder, not two. The 62 has two, but that doesn"t look like it started out as a 62, either. Must be a 3rd party unit. There were plenty of outfits back in the day made stuff for these machines. Here is how it is currently mounted. The Welder I have used in the past to do work on other equipment hasn't made it over yet but I think we will build a similar bracket. Maybe moving the verticle that the hydraulic arm mounts to back as far as we can to potentially shift more weight to the rear. Now that I think about it though that might mess up the geometry on the front and potentially damage the nose of the tractor.